SCVHistory.com HD7601 | Hart School District | Board & Administration (Partial), 1976. 1976 — From the inaugural 1976 Saugus High School Sword & Shield Yearbook: The administration and school board that opened Saugus High School (partial). First day of class was Sept. 6, 1975. 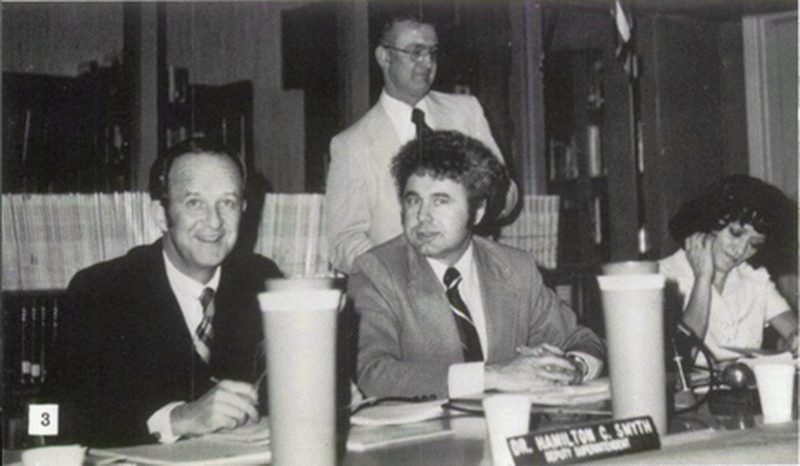 From left: Dr. H. Clyde Smyth, acting superintendent; Kenneth Wullschleger, school board president; Connie Worden (later -Roberts), school board member; Dr. Edgar Fickenscher (standing), assistant superintendent for business services. HD7601: 9600 dpi jpeg from smaller jpeg.